Brownie is an affectionate four-year-old Labrador retriever mix. He had the great fortune of being adopted and cared for by Marty, grandmother to Tommy and mother to Bob Habas. Brownie had previously been diagnosed with parvovirus and, consequently, initially had some trouble being adopted. Two other puppies, a yellow and a black Labrador, faced similar long odds, but Marty rescued them, too. 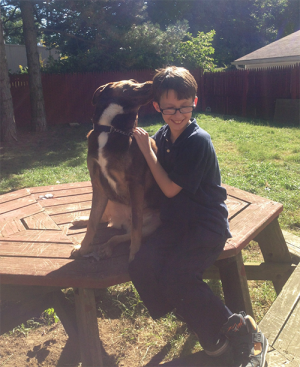 Brownie shares a deep, meaningful bond with Tommy, who was adamant about adopting Brownie and even filled out the adoption application himself at just 10 years old! Tommy shows his love for Brownie by faithfully walking him every day and sleeping next to his buddy every night. For his part, Brownie made it clear to the household that he missed Tommy while he was away at camp this summer: could summer camp be in Brownie’s future? In September of 2016, Marty noticed a growth behind Brownie’s left shoulder. Marty has had extensive experience with pet rescue and had a bad feeling about this growth. Given its size, nearly that of a baseball, and the fact that it did not feel like a fatty tumor, Marty was especially troubled. Worse yet, the tumor was growing quickly. Upon examination, the primary care veterinarian expressed deep concern and referred Marty and Brownie to a specialty hospital, one that specifically treats cancer. The specialist recommended a CT scan, which confirmed cancer: soft tissue sarcoma. Worse yet, the tumor was pressing on the lung and the shoulder muscle, meaning that surgery would be far too invasive an option. But a surgeon at the specialty hospital offered some encouragement and told the family not to give up hope. He referred the family to PetCure Oncology at Care Center in Cincinnati, Ohio, for stereotactic radiation (SRS/SRT) treatment. When Marty was asked what thoughts had raced through her mind upon hearing the diagnosis, she said that because Brownie was still so young, she wanted to give him a chance at a long, healthy, and happy life. Doing nothing would mean Brownie would have only six months to live: this was not an option. And Tommy was heartbroken upon learning of Brownie’s diagnosis. He worried that the cancer would be cured only to eventually return, perhaps after just a year, but Marty reassured Tommy and encouraged him to keep thinking positively about Brownie’s future. 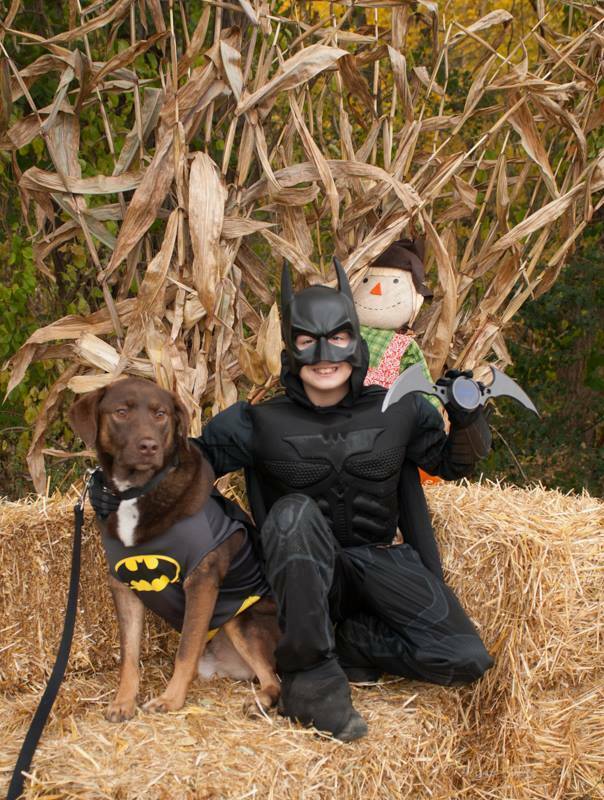 Tommy and Brownie won a costume contest as Batman and Batdog! In early November 2016, Marty drove the few hours from her home in Akron to PetCure Oncology at Care Center in Cincinnati. Brownie then had a CT scan to prepare for treatment on November 3. SRS treats the tumor by delivering radiation with sub-millimeter precision to kill the tumor cells while minimizing exposure to the surrounding healthy tissue. SRS is precisely aimed with CT guidance and involves far fewer treatments compared to conventional radiation, which can require as many as 20 or more treatments. Because this tumor was growing so rapidly, three sessions were delivered consecutively from November 7–9, 2016. After treatment Brownie was able to return home, ate, and then slept comfortably through the night. Marty explained the entire process to Tommy, who went from being skeptical to being a believer. Tommy would tell people, “My dog has cancer, and he’s getting well.” He has faith that Brownie has a new “leash” on life. How Is Brownie Doing Now? The past February’s CT scan showed that the tumor had shrunk by 50 percent. And then there was more good news: the tumor was no longer touching Brownie’s rib or lung, allowing Brownie to breathe without any difficulty. Following a tumor scan in August, the tumor had continued to shrink and the remains of the tumor were surgically removed in February of 2018. The combination therapy of SRS/SRT and surgical removal of tumor remains was a success! Brownie was declared cancer free! The one side effect of Brownie’s SRS/ SRT treatment is the newly minted white patch of fur he now sports. But that patch has somewhat ironically transformed itself into a mark of beauty and charm. Brownie’s many admirers tell Tommy that they find the mark beautiful, and Tommy has enthusiastically stated that Brownie is indeed a very rare chocolate Lab. Our team is ready to offer you guidance on your pet’s cancer journey. If you would like to schedule a consultation to discuss treatment options for your pet, please contact the PetCure Oncology location nearest you. 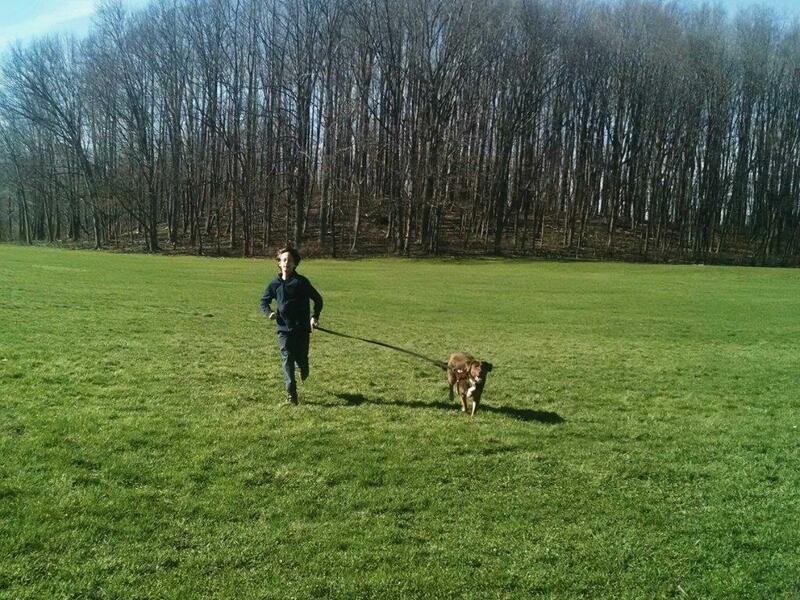 Tommy and Brownie enjoy a fun run in the park!